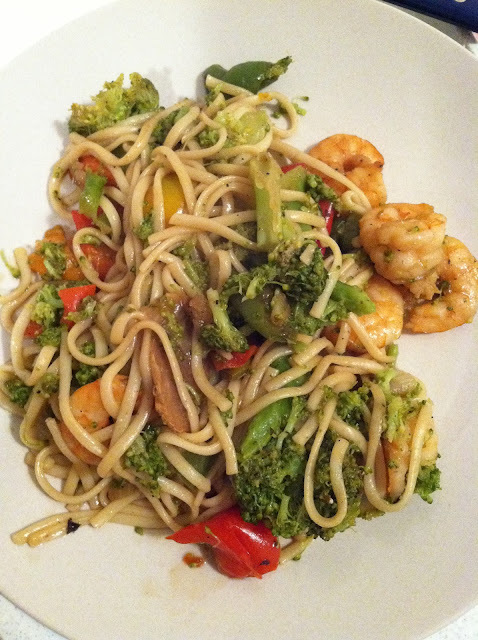 I love stir fry because its healthy, delicious, quick and easy to make. I decided to add shrimp this time and some noodles. I was out of spinach noodles, so I had to use regular spaghetti noodles. I stir fried the veggies, then shrimp, then added both together and poured the noodles right in. I then added some more teriyaki sauce (I'm obsessed with Teriyaki :) ) and voila! Nice recipe!. The photo of this recipe is truly looks delicious and amazing. I'm sure my family will love this very much. I will ask my sister to help me to cook this one. I wish you would also post a stir fry sauce. Thank you very much.